TOYOTA Racing will start from third place on the grid for the WEC Six Hours of Silverstone after today’s qualifying session at the British track. 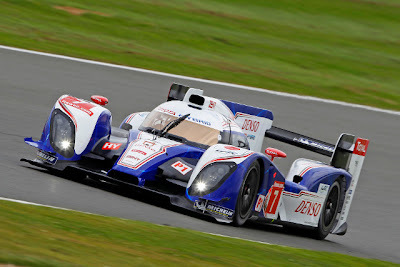 Nicolas Lapierre took the wheel of the #7 TS030 HYBRID for the 20-minute qualifying and had difficult track conditions to contend with following heavy rain earlier in the afternoon. With team-mates Alex Wurz and Kazuki Nakajima watching closely, Nicolas left the pits with intermediate Michelin tyres on a drying track. But with a dry line emerging he recorded only one flying lap before switching to slick tyres, a decision which proved to be correct as he soon moved to the top of the time sheets. Despite Nicolas consistently improving his lap times, the #7 slipped to third in the final few minutes, giving TOYOTA Racing a second-row start for its second race in the FIA World Endurance Championship. Nicolas was also at the wheel in this morning’s one-hour final practice, which he shared with Kazuki. The session was disrupted late on when Nicolas was hit by a slower car, causing a puncture and damage to the rear end, which was replaced before qualifying. Following the Sunday morning warm-up (08.55-09.15) the six-hour race begins at midday with a rolling start.